Members of Fossil Free Hastings, spokesperson Emily Johns left, pose outside Hastings Weather Station with a copy of the WMO report. The graph shows global temperature changes since 1880 (photo: FFH). The WMO report notes that “…the period 2011–2015 was the warmest five-year period on record, consistent with established long-term warming trends due to rising levels of greenhouse gases.” If its expectation that 2016 will be the hottest year on record proves correct, 16 of the 17 hottest years ever recorded will have been in this century. The letter was written in the name of various pro-divestment groups in East Sussex, including Eastbourne, Lewes, Forest Row and Brighton as well as Hastings, who are acting together under the name of Divest East Sussex. The East Sussex Pension Committee, which met on Wednesday (30 November), manages the East Sussex Pension Fund which has an estimated £172 million of local people’s pensions invested in oil, gas and coal. In the UK as a whole, councils have some £14 billion of pension funds invested in fossil fuels. “We believe that there is a strong financial case for the East Sussex Pension Committee to divest local people’s pensions from oil, coal and gas companies, because of the financial risks associated with such investments,” said Fossil Free Hastings spokesperson, Emily Johns. 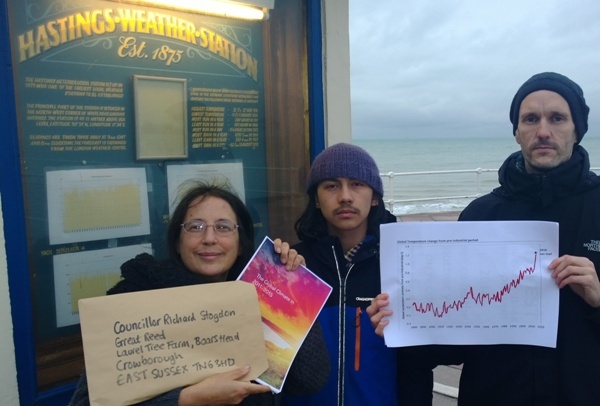 “However, the WMO report also clearly shows the damaging effects that these investments are having on the balance of the earth’s climate.” She urged all East Sussex residents to sign the group’s divestment petition. The question of divestment was also raised at the pension committee’s last meeting in September, when on behalf of the Labour group, Cllr Tania Charman reported on Hastings Borough Council’s recent motion supporting divestment and called on the committee to start considering alternatives. At this meeting, Julia Hilton of Fossil Free Hastings was able to give a five-minute speech to the committee in support of the petition calling on the East Sussex Pension Fund to divest its holdings in fossil fuels. The ‘engagement’ approach followed by the East Sussex Pension Committee in the past – seeking to persuade fossil fuel companies to change their business models – had largely proved ineffective, Ms Hilton told HOT. But under a new code of conduct, pension fund trustees are now obliged as part of their fiduciary duty to consider environmental, social and governance factors when making investment decisions – and considering climate risk was clearly part of that duty, she said. At the September meeting one of the committee members, Tory Cllr Bob Standley, suggested the committee should seek more information about the pros and cons of fossil fuel divestment. In response, the finance officer offered more training. HOT asked the five committee members – Cllrs Michael Wincott (Labour), David Tutt (Liberal Democrat) and Frank Carstairs (Ukip), as well as Cllrs Stogden and Standley – where each of them stands on divestment, but has so far received no reply.